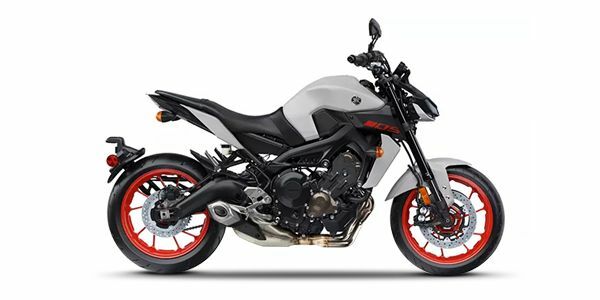 Yamaha has launched the 2019 MT-09 in India. Now priced at Rs 10.55 lakh (ex-showroom), the updated model is Rs 16,000 more expensive than before. For this, you get a new white paint scheme. Other than the mild cosmetic update, the motorcycle remains unchanged. Powering it is still the same three-cylinder, four-stroke engine which produces 115PS of power and 87.5Nm of torque at 8,500rpm. Suspension duties here are handled by USD forks at the front and a swingarm monoshock unit at the rear. Braking hardware consists of twin 298mm discs at the front and a 245mm disc at the rear. In terms of features, the Yamaha MT-09 comes with a slipper clutch, ride-by-wire, quick shifter, LED headlamps and a fully digital instrument cluster. It competes against the Kawasaki Z900, Suzuki GSX-S750 and the Triumph Street Triple S.
Yamaha MT 09 prices start at Rs. 10.55 lakh (Ex-Showroom). Yamaha MT 09 is available in 1 variants and 3 colours. Share your experiences with MT 09? The claimed ARAI mileage for the Yamaha MT 09 petrol is 25 kmpl. The MT-09 is the first offering from the MT-series for the Indian market. The MT-09 is a good option for someone looking at a powerful and easy to use performance streetbike. Q. Which is best MT 09 and Z900? Q. Which is best among the Yamaha bikes in the price range of Rs. 1-2 lakhs? Sharp, unhinged, borderline lethal, is the MT-09 the last of its kind? Launched at the 2016 Auto Expo, we’ve finally managed to get our hands on the Yamaha MT-09. Here are our first impressions on Yamaha’s middleweight naked.